Mike Schmidt was the personification of talent at the hot corner, possessing a combination of raw power, batting skill and defensive finesse. His brute strength enabled him to lead the league in homer eight times, and rack up more than 500 career home runs. His 500th home run came on April 18th, 1987 to clinch a win against rival Pittsburgh. The Phillies had a comfortable 5-0 lead over the Pirates, but Pittsburgh rallied for six runs in the bottom of the eighth to take a 6-5 lead. In the ninth, Juan Samuel kept the game alive for the Phillies with a hard slide into second base to break up a potential a game-ending double play. 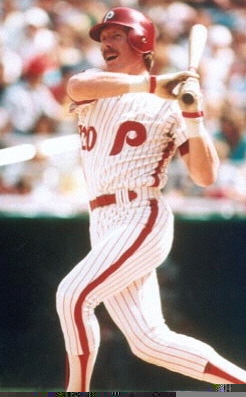 After a walk to Von Hayes, the Phils had two on and two out, and Schmidt came to the plate looking for his 500th homer and a chance to win the game. Pirates reliever Don Robinson fell behind 3-0. Schmidt pounded the next pitch over the wall in left for No. 500 and an 8-6 Phillies victory. After the game, Schmidt told reporters the homer was "the greatest thrill of my lifetime."